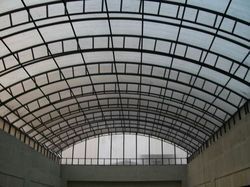 Leading Manufacturer of poly carbonate roofing sheet and poly carbonate sheet from Sonipat. With the support of our experts and sophisticated in-house facilities, we have been able to offer an array of Poly Carbonate Roofing Sheet. Having impact strength about 200 times higher than the common glass, offered roofing sheet is manufactured using optimum quality poly carbonate and innovative technology. Available for our esteemed clients in variegated sizes and designs, this roofing sheet is in line with set industry standards. With a precise understanding of the relevant industry, we introduce ourselves as the leading supplier of Poly Carbonate Sheet. Manufactured by our adept professionals using top notch quality poly carbonate and sophisticated technology, this sheet is used to replace glass, toughened glass and polyethylene membrane in many fields such as agriculture, industry, public buildings and ornaments. Tested by our quality examiners on variegated parameters, this sheet is available for our clients at market leading prices.